Generally Merz-Price protection based on circulating current principle provides the protection against internal earth faults. But for large generators, as there are costly, an additional protection scheme called restricted earth fault protection is provided. When the neutral is solidly grounded then the generator gets completely protected against earth faults. But when neutral is grounded through earth resistance, then the stator windings gets partly protected against earth faults. The percentage of windings protected depends on the value of earthing resistance and the relay setting. In this scheme, the value of earth resistance, relay setting, current rating of earth resistance must be carefully selected. The earth faults are rare near the neutral point as the voltage of neutral point with respect to earth is very less. But when earth fault occurs near the neutral point then the insufficient voltage across the fault drivers very low fault current than the pick up current of relay coil. Hence the relay coil remains unprotected in this scheme. Hence it is called restricted earth fault protection. It is usual practice to protect 85% of the winding. The restricted earth fault protection scheme is shown in the Fig. 1. Consider that earth fault occurs on phase B due to breakdown of its insulation to earth, as shown in the Fig. 1. The fault current If will flow through the core, frame of machine to earth and complete the path through the earthing resistance. The C.T. secondary current Is flows through the operating coil and the restricted earth fault relay coil of the differential protection. the setting of restricted earth fault relay and setting of overcurrent relay are independent of each other. Under this secondary current Is, the relay operates to trip the circuit breaker. The voltage Vbx is sufficient to drive the enough fault current If when the fault point x is away from the neutral point. If the fault point x is nearer to the neutral point then the voltage Vbx is small and not sufficient to drive enough fault current If. And for this If, relay can not operate. Thus part of the winding from the neutral point remains unprotected. To overcome this, if relay setting is chosen very low to make it sensitive to low fault currents, then wrong operation of relay may result. The relay can operate under the conditions of heavy through faults, inaccurate C.T.s, saturation of C.T.s etc. Hence practically 15% of winding from the neutral point is kept unprotected, protecting the remaining 85% of the winding against phase to earth faults. Let us see the effect of earth resistance on the % of the winding which remains unprotected. Consider the earth resistance R used to limit earth fault as shown in the Fig. 2. The value of the resistance R limits the earth fault current. If the resistance R is very small i.e. the neutral is almost solidly grounded, then the fault current is very high. But high fault currents are not desirable hence small R is not preferred for the large machines. For low resistance R, the value of R is selected such that full load current passes through the neutral, for a full line to neutral voltage V.
In medium resistance R, the earth fault current is limited to about 200A for full line to neutral voltage V, for a 60 MW machine. In high resistance R, the earth fault current is limited to about 10 A. This is used for distribution transformers and generator-transformer units. Now higher the value of earth resistance R, less is the earth fault current and less percentage of winding gets protected. Large percentage of winding remains unprotected. Where Io = Maximum operating current in the primary of C.T. If relay setting used is 15% then Io is 15% of full load current of the largest machine and so on. 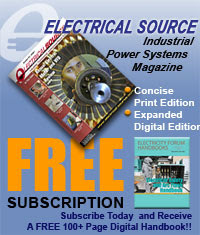 Greater percentage of windings of small capacity machines running parallel get protected. 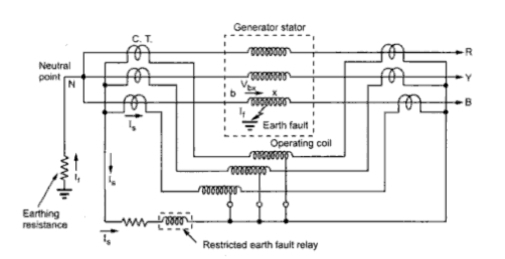 Example 1 : A generator is protected by restricted earth fault protection. 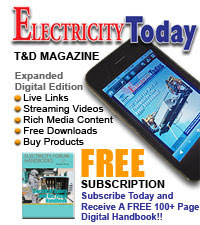 The generator ratings are 13.2 kV, 10 MVA. The percentage of winding protected against phase to ground fault is 85%. The relay setting is such that it trips for 20% out of balance. Calculate the resistance to be added in the neutral to ground connection. Relay setting is 20% out of balance i.e. 20% of the rated current activities the relay. 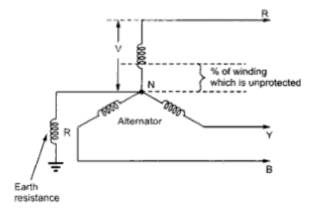 Example 2 : A star connected 3 phase, 12 MVA, 11 kV alternator has a phase reactance of 10%. It is protected by Merz-Price circulating current scheme which is set to operate for fault current not less than 200 A. Calculate the value of earthing resistance to be provided in order to ensure that only 15% of the alternator winding remains unprotected.